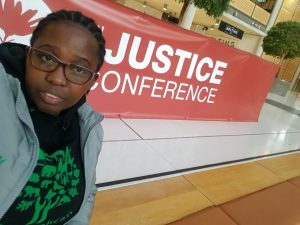 The 2 day conference was held at Wembley in London’s greenest venue The Drum 2-3 November 2018. the line up of speakers was chosen from a wide range of experts working on social justice issues like human trafficking, reconciliation, environmental issues, prosecuted Christians and a whole more. Mandisa Gumada (Green Anglicans) was amongst those invited to give a talk about the kind of work they as Anglicans in Southern African do. the topic was IS LIFE IN IT”S FULLNESS POSSIBLE? alongside her were 3 other young people doing phenomenal things. Dora Jejey an actress and an activist, Jeremy Williams a writer together with Charlotte Instone founder of Know the Origin clothing company. all these young people had one thing in common, advocating for the environment in all ways possible. Mandisa highlighted the reality of climate change and injustice it pose in Africa particularly in Eastern Cape where she was born, a place where water supply is not there in rural areas, where children still go to school in mud schools which deteriorate every extreme rainfall or flooding. She touched on how inequality in her young democratic country has taught her to be mindful of those less fortunate as she now resides in Durban a place totally different to Flagstaff where she visits her mother every second month. She spoke about how she and other committed young people encourage others to join the green movement in their area (dioceses and parishes and institutions) and start saving water, organising cleaning ups, eliminating single use plastic bags in their groceries. She further encouraged the English people to look out for their neighbours, she further explained the as not those their see in front of them but all the citizens of the world, the animals and plants ALL of God’s creation.